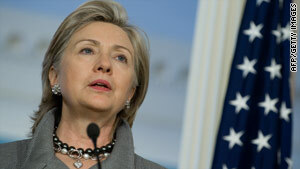 Washington (CNN) -- Secretary of State Hillary Clinton announced the United States will give $60 million to the U.N. Relief and Works Agency for help to Palestinian refugees on Friday, a move designed to improve the lives of 4.7 million people. The aid comes as the United States and the international community struggle to provide increased aid to Palestinians living in Gaza. In May, in a deadly clash aboard a flotilla carrying aid to Gaza, Israeli forces killed nine activists. Israel subsequently has said it will ease restrictions on aid going into Gaza but will not end its naval blockade. The United States already is the largest single source of support for refugees and refugees and victims of conflict internationally, Clinton said, providing $1.7 billion last year, including $640 million for the U.N. High Commissioner for Refugees, or the UNHCR. Clinton made the comments at a World Refugee Day event, co-hosted by the Department of State and the UNHCR. It included live interactive video feeds with High Commissioner Antonio Guterres and an Iraqi refugee family in Syria; UNHCR Goodwill Ambassador Angelina Jolie; and a UNHCR official and a Congolese man displaced because to activities of the Lord's Resistance Army in the Democratic Republic of the Congo. "We are all vulnerable no matter how comfortable our lives may appear to be," Clinton said. "But we too, around the world, those of us who enjoy the benefits of the life that we have built or inherited, we too are vulnerable to war and conflict, droughts and floods, environmental disasters as we've seen even in our own country." Clinton said that many of the refugee problems cannot be solved simply with humanitarian aid. "It's a question of better governance, more accountable governance, of political and diplomatic efforts, of reconciliation and peace, of the growth of democracies and economies." she said. Angelina Jolie, with 34 refugee families from Colombia living on the border with Ecuador, said they were "terrified" and that almost everyone in the families had someone who had been murdered. "They are so grateful just to be safe," she said.